This device tracks levels of the deadly, odorless gas but at a steep price. Radon doesn’t get as much attention as other indoor air pollutants, such as carbon monoxide and asbestos, but it’s every bit as dangerous. The naturally occurring colorless, odorless gas is the leading cause of lung cancer in the United States after smoking, according to the EPA. Because it’s a byproduct of naturally occurring breakdown of uranium in soil, rocks, and water, it’s found all over the U.S., indoors and out. But people get their biggest exposure where they spend the most time: at home. You can check radon levels in your home using charcoal-based kits, but these usually require you to test your levels for up to 90 days—radon is a cumulative threat, so levels need to be monitored over a span of time for accuracy—and then you must ship the kit to a lab for analysis. 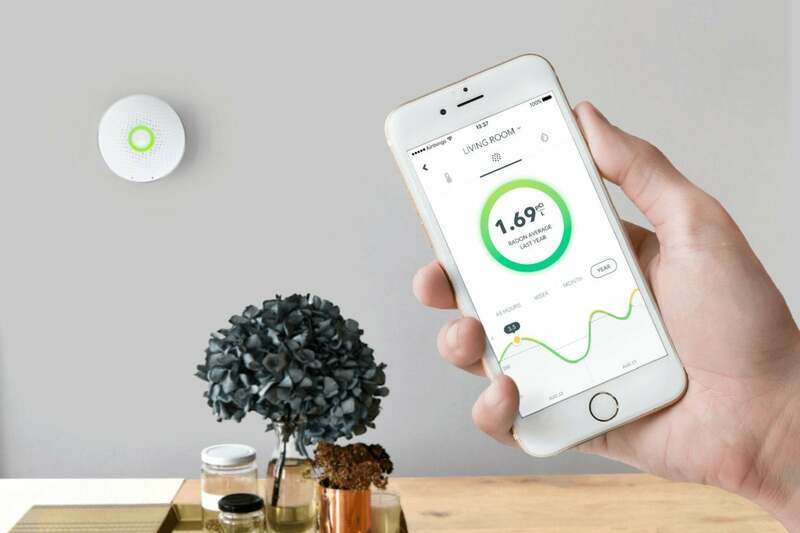 Airthings, a Norway-based tech company, developed the Wave ($200), a Wi-Fi enabled, battery-powered indoor air quality monitor as a more expedient testing solution. The Wave is about the size of a smoke detector. Its surface is pocked with tiny holes and features an LED ring in the center that glows different colors to indicate air quality. A pair of sensors are located near the bottom edge. Editors' note: This article was updated on April 5, 2018 to include information about two new features added after our review: IFTTT integration and a new web interface that allows you to check your home's radon level, ambient temperature, and humidity level from anywhere you have internet access. The Wave’s LED ring glows different colors to indicate air quality. The Wave comes with two AA batteries installed, so all you need to do is remove the tab sticking out of the battery compartment and the device’s voice prompt will tell you it’s ready to be paired with your phone. The Airthings app walks you through this process. Once you’re connected, you can mount the Wave to a wall using the supplied bracket and screws. For accurate readings, it’s advised not to mount it near windows or vents. 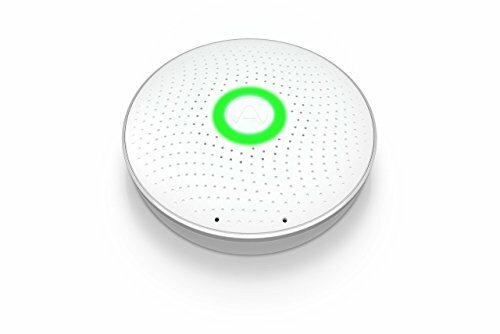 It takes about an hour after setup to get your first radon reading, according to Airthings. You can get a general radon-level status by waving your hand in front the Wave. 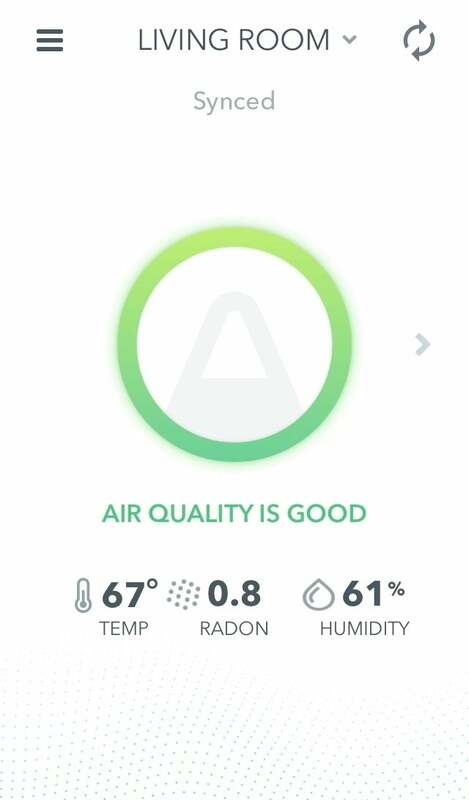 The indicator ring will glow green if your air quality is “good.” If it’s yellow, it means the Wave is detecting above the recommended levels of radon and you should continue measuring. Red means you must take action to reduce your radon levels. The Airthings Wave app lets you track radon levels more closely, downloading the latest data every time your phone is within 30- to 50 feet of the detector and its Bluetooth radio is enabled. The home screen displays the same ring light as the Wave itself along with measurements for temperature, humidity, and the average radon level for the last 24 hours. The Wave app downloads the latest data whenever you’re near the device, so you can track radon levels in real time. Swiping to the right, you can get a longer-term look at each of these air-quality elements. You can toggle to see the average levels for each over the last 48 hours, week, month, or year. In each case a graph of historical values is displayed across the bottom of the screen. 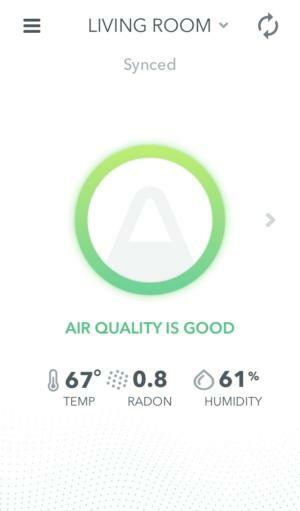 In an update released after we completed testing, Airthings added the ability check your home’s radon levels, as well as temperature and humidity, from any web browser. The new Airthings online dashboard lets you monitor multiple rooms, manage devices, analyze historical data and export it as a .CSV file. You can login with the same credentials you use in the Airthings Wave mobile app. Airthings added IFTTT integration in this same update. Currently, there are a half dozen applets available that expand the capability of the device. Now you can have the Wave flash your Philips Hue lights red or send you an email when Radon levels rise too high. The device can also push you notifications when your home gets cold or humid, and brag about your good radon levels with a tweet. Though there is technically no safe level of radon, the EPA has set 4 pCi/L (picoCuries per liter of air) as the “action limit.” Fortunately, the levels in my home were well below that. If yours aren’t, it’s time to turn to a radon mitigation service that can install a system to reduce radon levels and prevent them from building up again. Whether you use a standard short-term test kit or the Airthings Wave, you need to monitor levels for at least 48 hours to even approach an accurate reading. But because radon levels can fluctuate, a longer term approach is better. Airthings says the levels the Wave displays are accurate within 20 percent after one week and within 10 percent after a month. The wave is not cheap for such a one-trick device. Consider that a radon-test kit typically costs $15 to $35, including lab fees. Even at the upper end, you could test five rooms for less than it costs for the Wave. True, you can test your entire home with a single Wave just by moving it from room to room, but given that you’d need it to spend at least two days in each spot, it would admittedly take longer to test the whole house than the conventional method. What the Wave really seems to have over test kits is the ability to monitor radon levels in real time, rather than waiting days or weeks for lab results. Given the health hazard radon poses that’s not a small thing, but only you can decide if it’s worth $200. The Airthings Wave gets high marks for making it easy to track radon levels on the fly, but the price tag could be a deterrent.